On the way to Kathmandu, at Heathrow Airport, trainer-wearing, mobile-phoning Buddhist monks stole our seats. This goes against everything that I or anybody else ever thought they knew about Buddhism, and only goes to show that that path to Enlightenment is longer and stonier than you'd think. From Kathmandu, we had planned to fly in to Lukla: the starting point for everyone and their mother who sets off for the mountains (if everyone and their mother want to ramble about the Everest region, which most of them do). And so we spent five happy hours (and I'm using the word "happy" very loosely here) at the domestic airport in Kathmandu, in the company of other dismayed hopefuls and hoards of natives who, doubtlessly, were not gloating at all about the fact that they could fly to their respective destinations, whilst the tourists, with all their Western equipment and functional wear, could not. My favourite bit about this whole experience (and I'm using the word "favourite" very loosely) was, how you stop caring after a while: There was a huge black box sitting right in front of the check-in counter, and at first, we were wary of it like you are wary of any item of luggage that doesn't seem to belong to anyone. But after a while, wariness made way to weariness, and I ended up sleeping on said box, seeing as it was the perfect height for my head to rest on, whilst the rest of my body rested on my backpack. That's how you can wage the war on terror in people's heads: make them sit around in airports till they're bored out of their skulls and willing to fraternise with potential enemy luggage, just because any possible alternatives seem even more horrid. Seeing as we couldn't fly (the flights for that day and the following three were cancelled), we decided to walk rather than spend even more endless hours waiting at the airport. 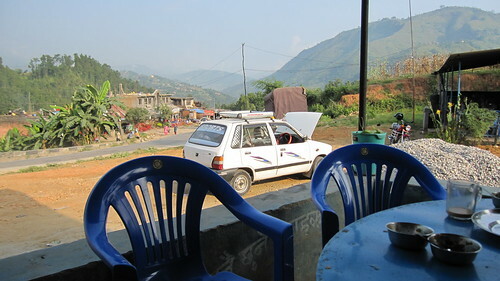 And so we hired a taxi, and it took us only nine and a half hours to drive out to Jiri - the town from which it would take us only six more days to walk to Lukla: the starting point of the actual Everest trek. But it was totally worth it. 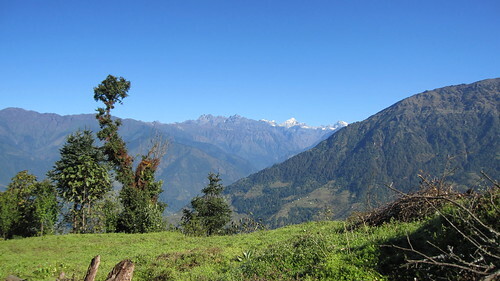 In fact, the route Jiri-Lukla turned out to be my favourite part of the trek, what with not being bloody freezing. This is the taxi that took us into the mountains. We had to stop every few hours to let the car breathe (see open bonnet). And then we walked. There were landscapes.